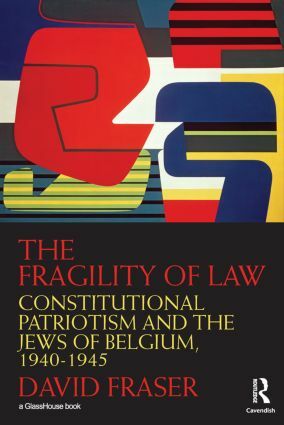 The Fragility of Law examines the ways in which, during the Second World War, the Belgian government and judicial structure became implicated in the identification, exclusion and killing of its Jewish residents, and in the theft - through Aryanization - of Jewish property. David Fraser demonstrates how a series of political and legal compromises meant that the infrastructure for antisemitic persecutions and ultimately the deaths of thousands of Belgian Jews was Belgian. Based on extensive archival research in Belgium, France, the United States and Israel, The Fragility of Law offers the first detailed exploration in English of this intriguing and virtually unexplored episode of Holocaust history. Belgian legal officials did not hesitate to invoke the provisions of international law found in the Hague Convention and those guarantees of individual freedom found in the national Constitution to oppose the demands of the German Occupying Authority. However, they remained largely silent when anti-Jewish persecution was at stake. Indeed, despite the 2007 official report of expert historians on Belgian state collaboration in the persecution of the country’s Jewish population, the mythology of "passive collaboration" which has dominated Belgian historiography and accounts of the Holocaust in that country, must be radically rethought.